Retailers and consumers in the European Union face barriers when trying to conduct business online. An effort to implement a digital single market could change that. The EU’s digital single market, or DSM, plan could improve e-commerce across borders within the union, modernize copyright regulations and improve cybersecurity, among other goals. Austria confronted its Nazi past much later than Germany, and one scholar believes that’s why Austria was one of the first European countries to embrace right-wing and populist politics in 1980s and 90s. As the United States gears up for the 2016 presidential election, voters must tackle the ever-present concerns of foreign policy and international engagement. In an era of globalization, increasingly open channels of information, disputes over land and growing trans-national trade, Americans are trying to figure out America’s role in the world. Listen to the entire July 8, 2016 episode. Thomas Weiss has spent 40 year studying global governance, the idea that international organizations and groups can work together to solve issues that transcend geographic borders. He'll talk with Suzette Grillot about what it would take for a new generation of intergovernmental organization like what happened after World War II. But first, she'll be joined by University of Oklahoma political economist and European Union expert Mitchell Smith to talk about what’s next for the United Kingdom and the European Union two weeks after the “Brexit” vote. Two weeks after a majority of British voters declared they wanted to leave the European Union, there’s still a tremendous amount of uncertainty about how exactly that’s going to happen. Six days from now British voters head to the polls for a referendum on whether or not to leave the European Union. The June 23 vote may be the first step toward concluding Britain’s more than 40-year awkward relationship with the rest of continental Europe. Listen to the entire September 11, 2015 episode. Suzette Grillot talks with Maxine Margolis, an anthropologist at the University of Florida and Columbia University’s institute of Latin American Studies. She’s spent her career studying the thousands of college-educated Brazilians come to the United States every year. But first, last week’s discussion of the ongoing migrant crisis continues with Mitchell Smith, who chairs the University of Oklahoma's European Union Center. He discusses the EU policy responses to the refugees and other migrants arriving in Europe. On Monday the 22 member states of the European Union plan to hold a special meeting in Brussels to discuss what to do about the hundreds of thousands of migrants fleeing areas of Iraq and Syria torn apart by self-proclaimed Islamic State militants. European Union Commission president Jean-Claude Juncker wants the nearly two dozen countries to endorse a plan forcing member states to grant asylum to nearly 160,000 refugees fleeing the Middle East. Listen to the entire July 24, 2015 episode. 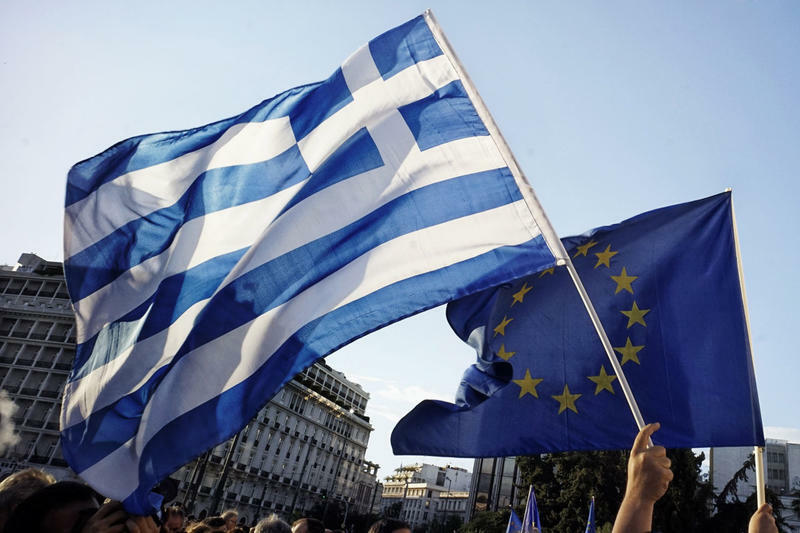 Guest host Rebecca Cruise is joined by University of Oklahoma professor and European Union expert Mitchell Smith about how Greece got to its current economic crisis, and why its citizens are still on a "quest for hope." Then Suzette Grillot talks with geographer Kathleen O’Reilly about the gender and social issues of sanitation projects in India. The Greek parliament passed a series of economic and judicial reform measures stipulated by creditors on Thursday, allowing talks to go forward on a bailout package for the country. If a deal is reached, it would mark the third bailout package for Greece in five years and is expected to be worth as much as 85 billion euros, according to the Associated Press. In Greece, a breakdown in negotiations between the Greek government and its creditors has put Greece on the verge of default and an exit from the eurozone. Greek banks were closed after a flood of fear-driven withdrawals, and they won’t open until next week. Greek citizens are being asked to decide the fate of the country in a referendum Friday on the economic terms that creditors are asking for in exchange for fresh aid. Listen to the entire February 27, 2015 episode. Rebecca Cruise and Suzette Grillot discuss tensions between Israel and the United States ahead of Prime Minister Benjamin Netanyahu’s address to Congress next week, and European nations that are working to develop a more unified energy policy. Then, a conversation with art historian Maya Stanfield-Mazzi. She studies pre-Colombian art in the Andes, and says the work of South America’s Inca culture was abstract, without a clear narrative. Listen to the entire August 1, 2014 episode. Samer Shehata joins Suzette Grillot to talk about democratic developments in Egypt, and how the conviction of journalists and questions about the fairness of May’s elections have affected the country’s relations with the United States. Later, a conversation about police cooperation and Europe’s internal security policy with Canisius College political scientist John Occhipinti. Europol, based in The Hague, Netherlands, is the European Union’s police office. Staffed by high-level police officers from the 28 EU member states, John Occhipinti says it functions as the “hub of a liaison network” that manages a database of criminal intelligence. Listen to the entire May 23, 2014 episode. University of Oklahoma Vice President for Student Affairs and Dean of Students Clarke Stroud joins Suzette Grillot again on their European tour to discuss the concept of “euroskepticism” and the European Union's parliamentary elections. Later, a conversation with UCLA historian Nile Green about putting Islam into the context of global history. He says the same religious fragmentation that causes sectarian violence in the Middle East leads to religious misunderstanding in the West. Listen to the entire December 6, 2013 episode. Suzette Grillot and Rebecca Cruise discuss China 's move to grab airspace over the East China Sea, and ongoing protests in Ukraine over a jailed political leader, and a scuttled trade pact with the European Union. The Dallas Morning News Mexico Bureau Chief Alfredo Corchado joins Grillot to talk about his 20-year career. His memoir Midnight in Mexico chronicles his coverage of the country’s war against the drug cartels. Thousands of people have gathered in Kiev's Independence Square over the past two weeks, where Orthodox priests chanted prayers at dawn and demonstrators are vowing to keep up their protests. The government is showing no signs of yielding, suggesting that the tensions that have gripped the country for two weeks are far from a resolution. Rebecca Cruise, the Assistant Dean of the College of International Studies at the University of Oklahoma, says the protests are about two things: The jailed opposition leader Yulia Tymoshenko, and the president’s decision not to sign agreements with the European Union that would bring them closer to Europe, both economically and politically. Listen to the entire November 8, 2013 episode. Earlier this week anti-American protests in Iran marked 34 years since the storming of the Embassy in Tehran, and the start of the 18-month hostage crisis. Suzette Grillot talks about the anniversary with Joshua Landis, who also provides a brief update on Saudi Arabia's frustration with the U.S. over Syria. Later, a conversation with Boston University modern European historian Jonathan Zatlin. He says parts of Europe's debt crisis can be explained by religious tension between the Protestant North and the Catholic South. Listen to Suzette Grillot's conversation with Boston University historian Jonathan Zatlin. Allied powers divided war-torn Germany into four zones of occupation after World War II, with three of those zones uniting in 1949 to form what became known as West Germany. The Soviet Union controlled the fourth zone, and East Germany remained within the Eastern Bloc’s sphere of influence for the next four decades. Boston University modern European historian Jonathan Zatlin says the divided nation served as a tripwire for all the tensions of the Cold War, and that Soviet dictator Joseph Stalin worried a united Germany posed a security risk.